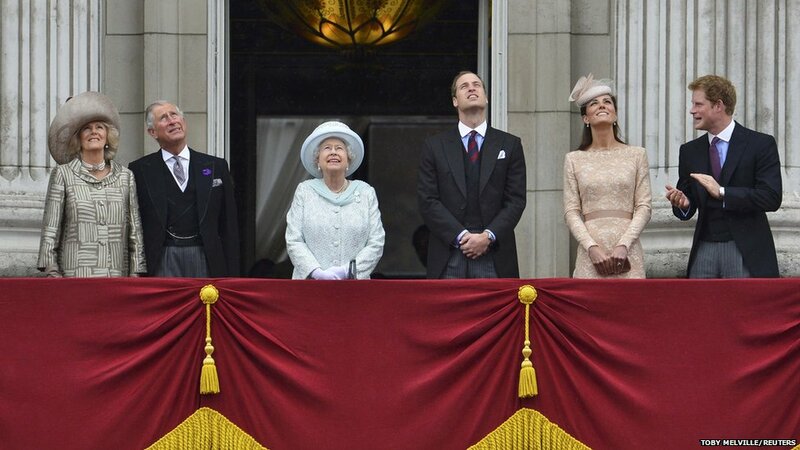 Four days of Diamond Jubilee events culminated in an appearance by the Queen on the Buckingham Palace balcony for a flypast, which had been in doubt due to the threat of bad weather. 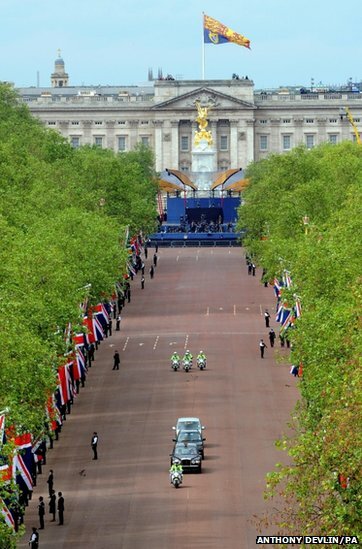 Crowds started to build up in the early morning outside St Paul's and Buckingham Palace. 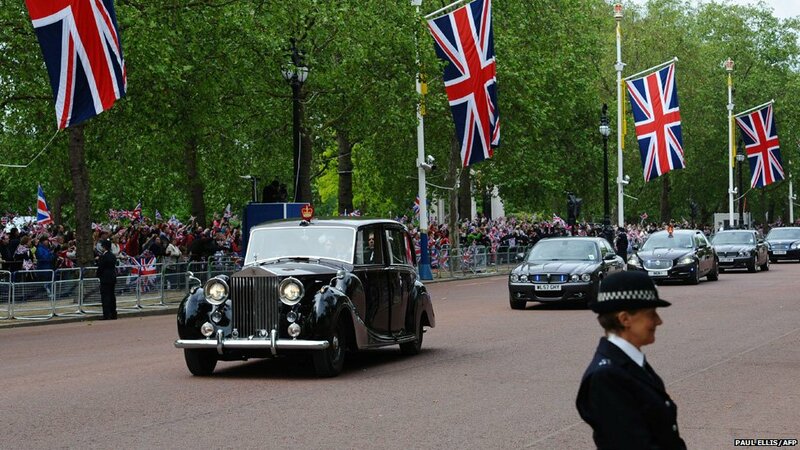 They cheered as the Queen and royal family members left Buckingham Palace by car for the service at St Paul's. 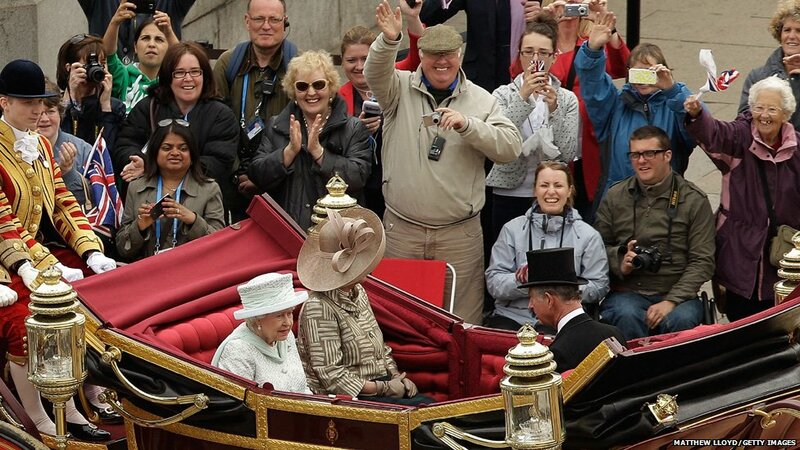 The Queen left at 10:15 BST in her state Bentley, accompanied by a lady in waiting. Prince Philip remains in hospital with a bladder infection and missed the final events marking the Queen's 60-year reign. Prince Charles, accompanied by the Duchess of Cornwall, the Duke and Duchess of Cambridge and Prince Harry, arrived at St Paul's at 10:22 BST in a fleet of cars from Clarence House. 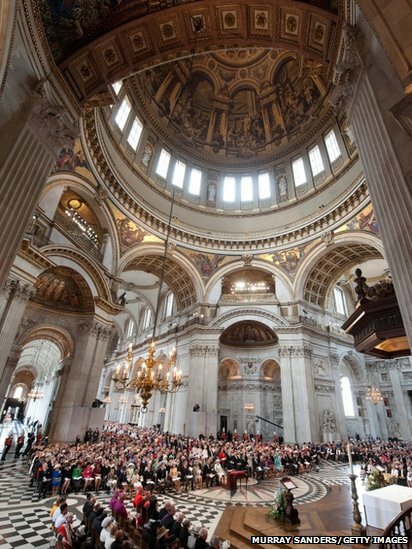 There was a fanfare as the Queen, wearing a mint green outfit of fine silk tulle, embroidered with tiny star-shaped flowers, arrived at St Paul's for the service at 10:30 BST and the crowds chanted "God save the Queen". 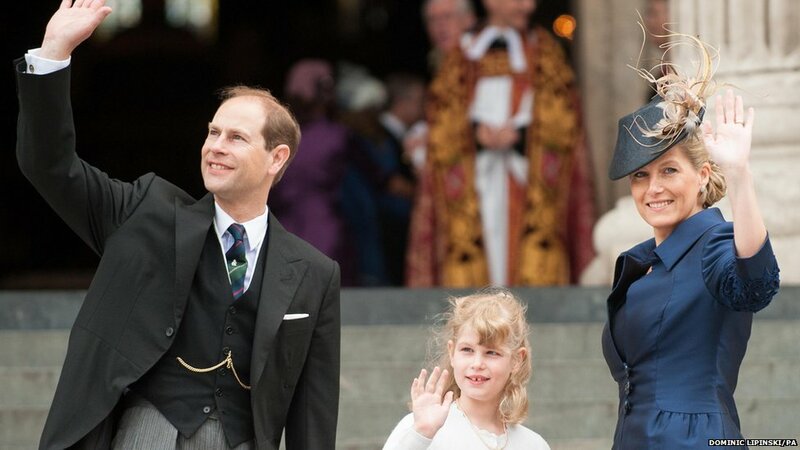 Guests, including leading politicians, military personnel and members of the royal family and household, took their seats inside the cathedral ahead of the service. 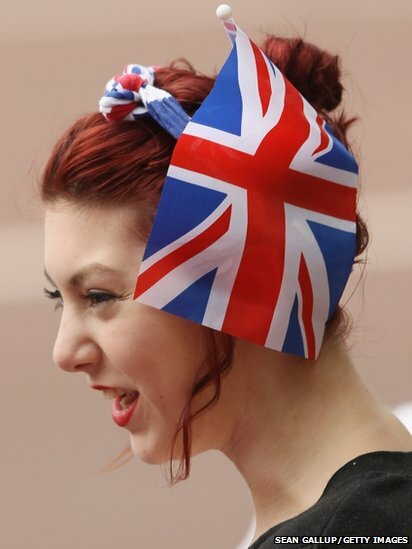 Prime Minister David Cameron and his wife Samantha arrived about 40 minutes before the start, followed a short while later by the Princess Royal's daughter Zara Phillips and her rugby-playing husband Mike Tindall, the Duke of York and his daughters Princess Beatrice and Princess Eugenie and the Earl and Countess and Wessex. 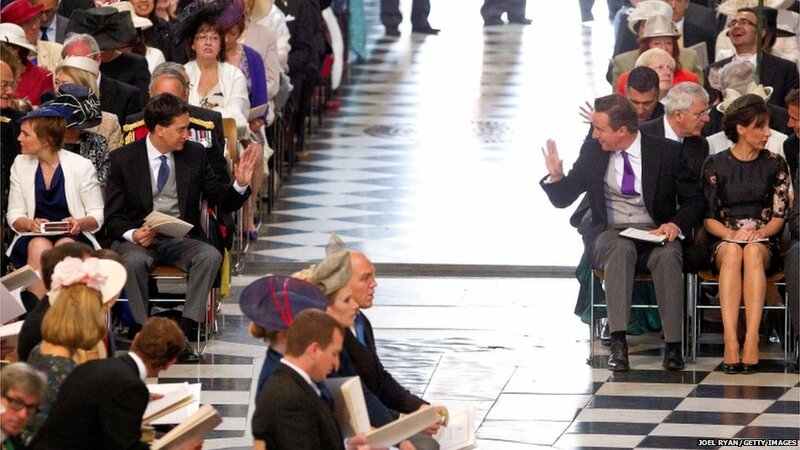 Prime Minister David Cameron, who gave a reading, led the large representation from the government. 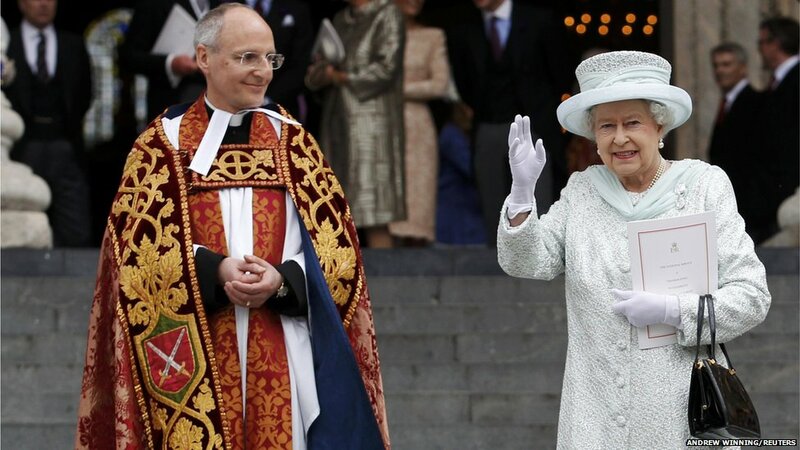 In his sermon the Archbishop of Canterbury paid tribute to her "lifelong dedication". 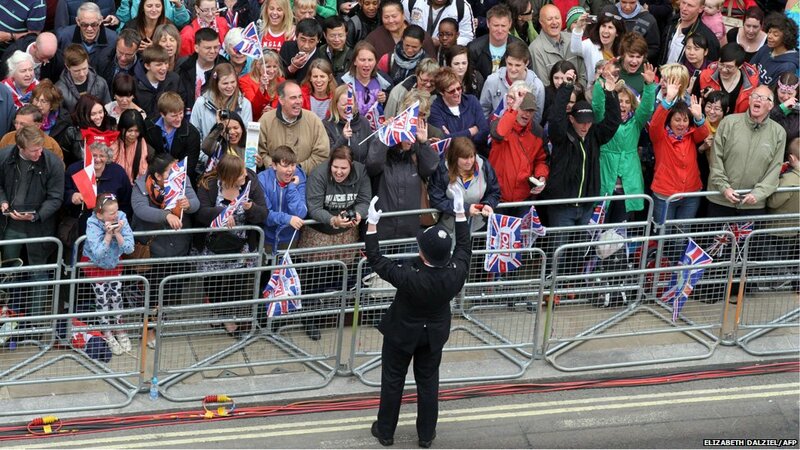 The Queen waved to the assembled crowds as she exited with Dean of Saint Paul's, David Ison. 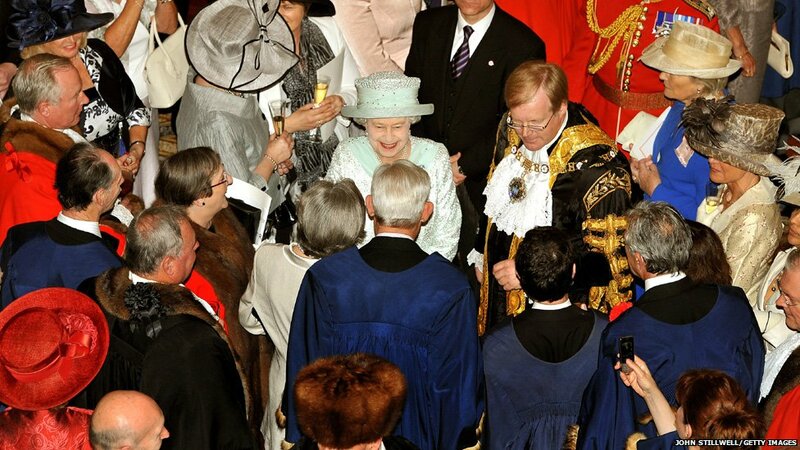 After the service, the Queen moved on to a reception at Mansion House - the official residence of the Lord Mayor of London. 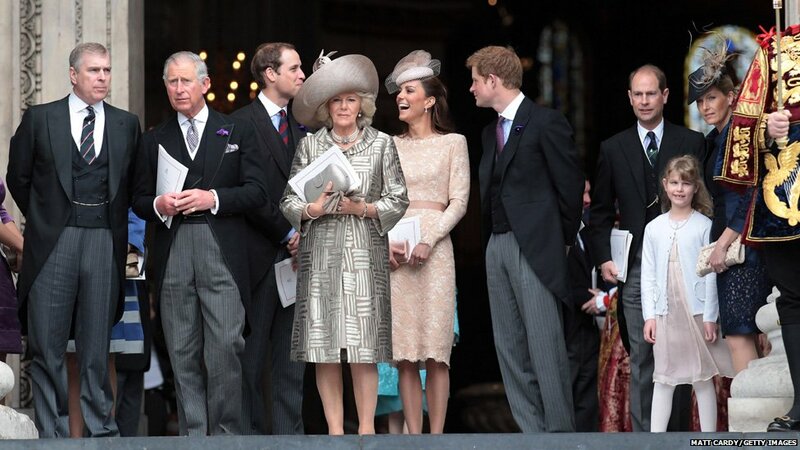 The Prince of Wales and Duchess of Cornwall, and William, Kate and Harry, left to attend a similar event at the Guildhall. The royal parties then moved on through crowd-lined streets to a City of London Livery companies lunch at Westminster Hall where they dined on salmon, followed by Welsh lamb, grilled Isle of Wight asparagus, Jersey Royal potatoes and chocolate delice, bread and butter pudding and berry compote with apple sauce. 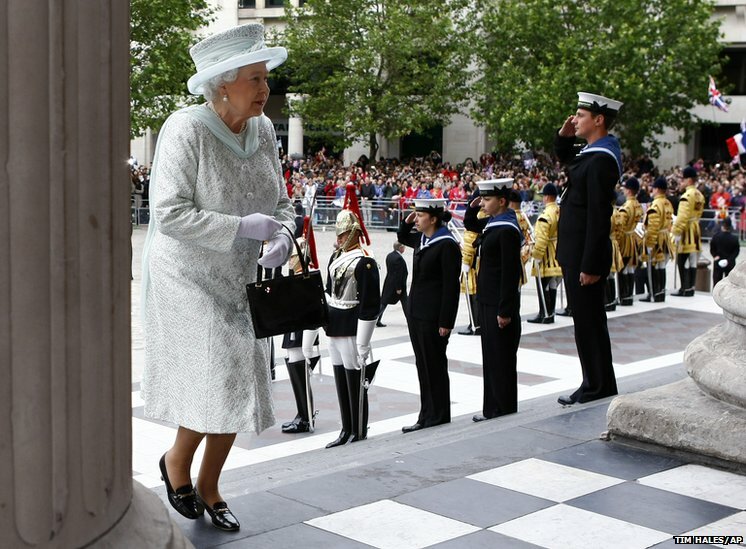 The Queen left Westminster Hall in an open-topped coach accompanied by Prince Charles and the Duchess of Cornwall. 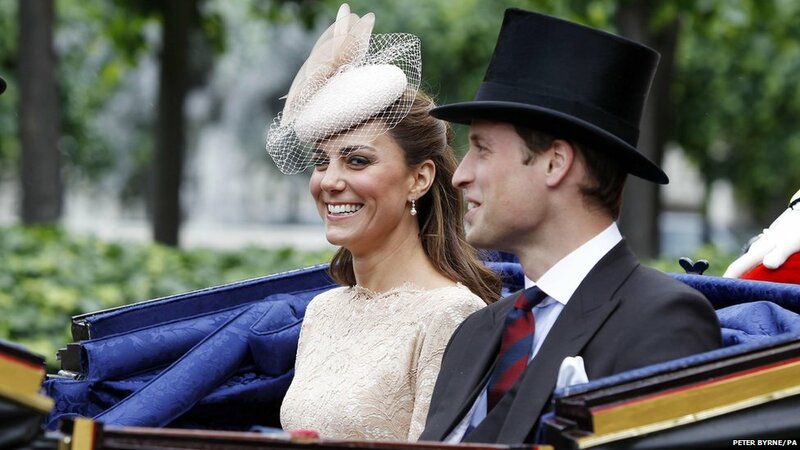 The Duke and Duchess of Cambridge, and Prince Harry followed in a second coach for the journey to Buckingham Palace. 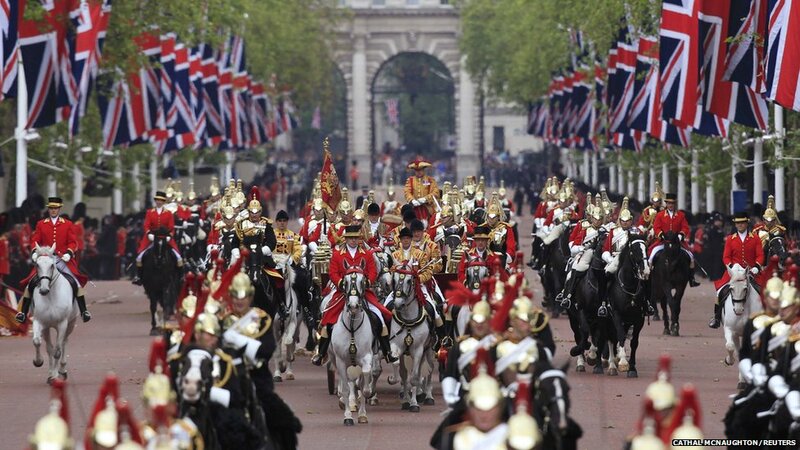 They were led along The Mall by soldiers from the Household Cavalry Mounted Regiment, and the King's Troop, Royal Horse Artillery, then fired a 60-gun salute. 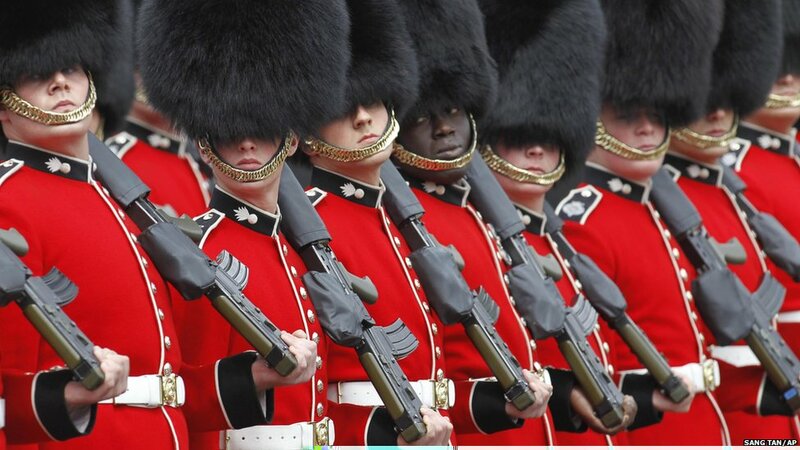 Guardsmen also lined the route. 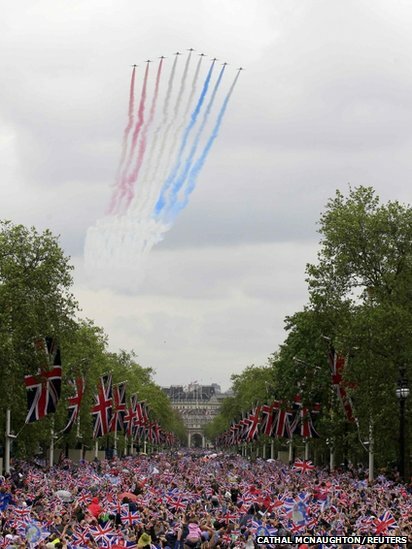 There was also a flypast by World War II aircraft and the Red Arrows.